For the last few days I’ve been working on a multi-day spread (MDS). It’s an idea from Book of Days with Effy Wild. 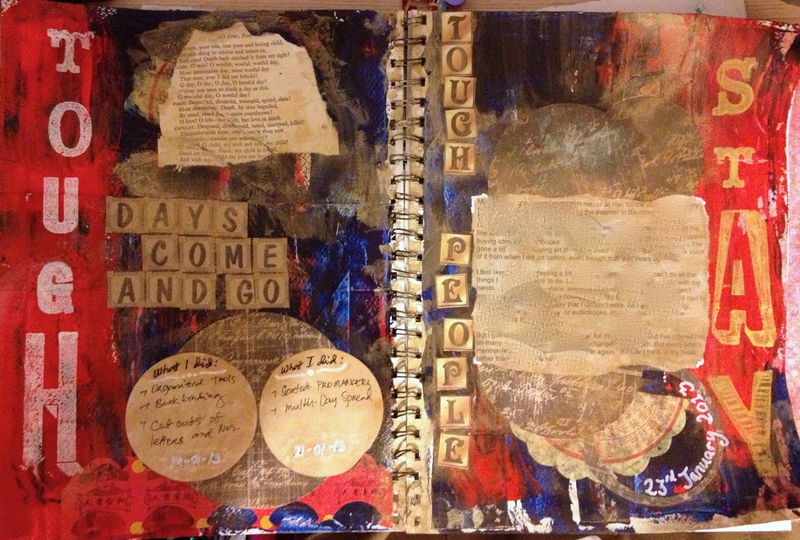 The title of my spread was ‘Tough Days come and go, Tough People STAY’. I used Reeves acrylic paints for the background, stamped the words TOUGH and STAY in paint and metallic ink, and used printed lettering for ‘days come and go’ and ‘tough people’. Tim Holtz distress ink pads aged some papers, and Golden’s metallic bronze glaze coloured others. I used text from Romeo and Juliet, the scene where Juliet’s body has been discovered. I used scrapbook papers for two days of my MDS, written by my carer. Another carer helped me write an entry about how I’ve been feeling and the effects of that. I don’t know where I got the quote, ‘Tough days come and go, Tough People stay’. I must have read it or seen it somewhere recently, but I don’t know where. What was in my head, was that life is TOUGH. When the days are tough, that’s when you need the people around you to be tougher. To stay with you. Keep at it with you. I’ve recently started on two new art projects for 2013 – Life Book 2013 and Book of Days. The Life Book is an annual thing started by Tamara over at Willowing, and the idea is to journal your life over the course of a year, to reflect on what’s happening and heal thyself through art. Through the year we get guidance from star mixed media artists on different techniques, with everyone sharing their Life Books. The first “warm-up” exercise was to create a Fairy Art Mother who will look over us and guide us through our year in art. 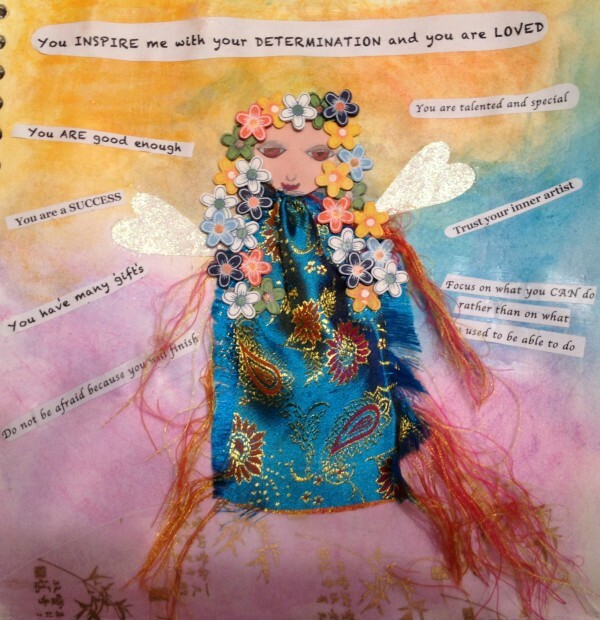 Today I finished my own Fairy Art Mother, my first page in my Life Book. It has a 3D effect and features a bunch of old materials fished out of my art stash, long forgotten and buried at the back of a cupboard. The background was done using watercolour pencils. Some of you will notice the top quote is borrowed from a Tracy Emin print, which my husband bought for me, and now hangs on my wall for inspiration. I’m also inspired by my carer Mary-Ann, who provided the hands and encouragement to keep me going every time I wanted to quit. I’m told I say that about every piece of art I do, so that’s why the messages in this piece are as they are. I’ve also started a project called Book of Days with Effy at Wild Soul Arts. It’s a little bit similar to the Life Book idea, and like Willowing they have a lovely, supportive community of artists and teachers, and so far I’ve mostly been watching and learning from the video tutorials Effy has posted. Now my first Life Book page is done I think I can now start planning my first Book of Days page.